If the Calendar below looks a little sparse, click on the CLUB NEWS. link in the left panel for the current Club Newsletter. * Observing Nights are when the moonlight will not obscure dim objects. A senior club member has volunteered to be the key contact for the evening(s) listed. They will determine, based on weather conditions, which one of the two nights they will be at the observing site. You must call them to coordinate meeting at the observing site. 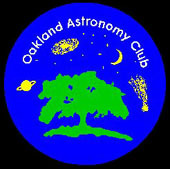 If the skies are clear - the club member has agreed to be at the site as long as one or more people have contacted them.